The emission reduction changes mandated for 2010 U.S. diesel chassis are here. A number of significant differences between 2009 and 2010 chassis will impact everyone in the supply chain, from the makers of the chassis to sweeper manufacturers to the people who buy them. Rob Cadle, Manager of Product Planning for Isuzu Commercial Truck of America, offers an in-depth analysis of the changes in his company's 2010 chassis, as well as an overview of the upcoming regulations and how this all is likely to affect chassis cost and vehicle longevity. The 2010 EPA emissions requirement is a further tightening of heavy duty emission standards. This is the last hurdle of a decades-long series of stepdowns in engine emission requirements that began in 1988. Nitrogen and oxygen compounds, especially, are the agents being targeted. These are contributors to smog and ozone, and are blamed for a host of health and safety problems. This series of regulations has resulted in an enormous reduction of visible and invisible pollutants emitted from heavy duty truck diesel engines. From 1988 until the 2010 standards, engine emissions have been reduced by 96%, an astonishing number. With the 2010 standards in place, a diesel engine will have only 1% of the emissions of the same size/class of engine in 1974. However, this is not being accomplished without some amount of engineering difficulty. Isuzu's approach to the 2010 standard, which is called Selective Catalytic Reduction (SCR). A catalytic convertor basically reduces the oxides of nitrogen targeted by the EPA into something not harmful to the environment. As part of the system's operation a 'Diesel Exhaust Fluid (DEF),' is injected into the exhaust stream just before the SCR catalyst. Those are the two things that are new; there is a catalyst and a fluid that has to be injected. Although much of the operation will be transparent to the operator, a new level of involvement will be required by chassis operators. An additional tank has been added to hold the DEF fluid needed by the engine. Fortunately, the system is largely automatic, only about a gallon of DEF will be used in a typical week-long operation (about 2% of the amount fuel used), and it appears that increases in fuel economy may well completely offset the cost of the DEF fluid. Cost is estimated to be in the $2.50/gallon range, and the fluid is a stable compound with that is not considered hazardous or toxic. According to Cadle, these current changes, like each round of emissions' improvement before it, has spawned adjunct technology that has resulted in better, longer-lasting engines. Because of the testing required for meeting the 2010 standards, Isuzu has been able to add a number of other technological advances to its engines this time out, as well. Fuel systems and air system technology are advancing, to just name two specific areas of improvement for 2010. The following 25-minute interview with Cadle is a 'must hear' for anyone who owns sweepers, whether one or a fleet of dozens. 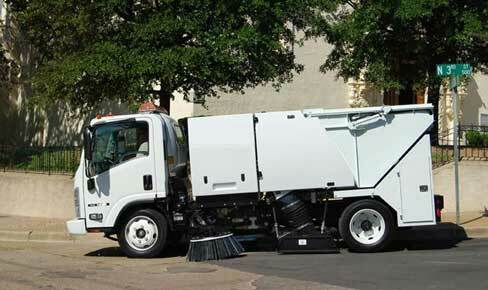 The information is targeted to the parking area and light-duty street sweeper marketplace, since Cadle's information covers Isuzu's N-series chassis. You'll also hear about the challenges faced by sweeper manufacturers in mounting, as well as the likely increase in chassis pricing end-users are facing. Note: The audio will play without downloading any files onto your computer. If you hear the interview at 'chipmunk speed,' you will need to download the latest version of Adobe's free Flash player. If you'd like to contact Rob Cadle, send an email to Rob.Cadle@isza.com. Isuzu Truck's corporate headquarters in Anaheim, California, may be reached by calling 714-935-9300.